Registration in Flowlu service takes less than a minute. To create an account click “Sign Up” button to register on the official site of the service. 2. Choose a module that you plan to use. You can delete modules you do not need and install new ones at any point of time. After successful registration in service, you will get an e-mail containing a link to address and your log-in. Congratulations on registration in Flowlu service! After registration, you are immediately transferred to activity feed. Let’s look closer at the main elements of management and fill in your personal profile. 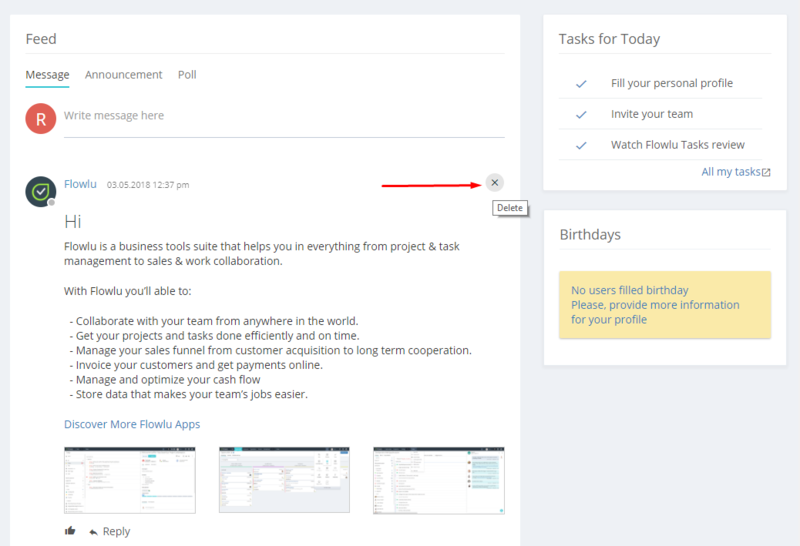 In the activity feed, you will see useful tips on working with service. All employees, who you invite to the site will be able to post regular, important messages and votings. If needed, you can delete advises on working in the system. For this purpose place, the cursor on advice and cross sign will appear in the top right corner. 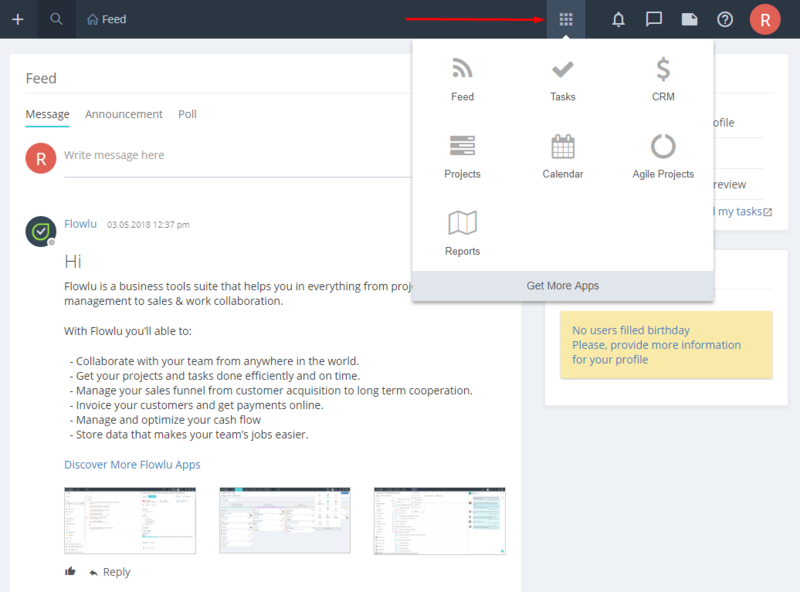 Button for system applications - tasks, CRM, projects, knowledge database, reports, etc. is placed in the top right corner. Using Get More Apps you can go to the full list of applications to install new or delete unnecessary applications. 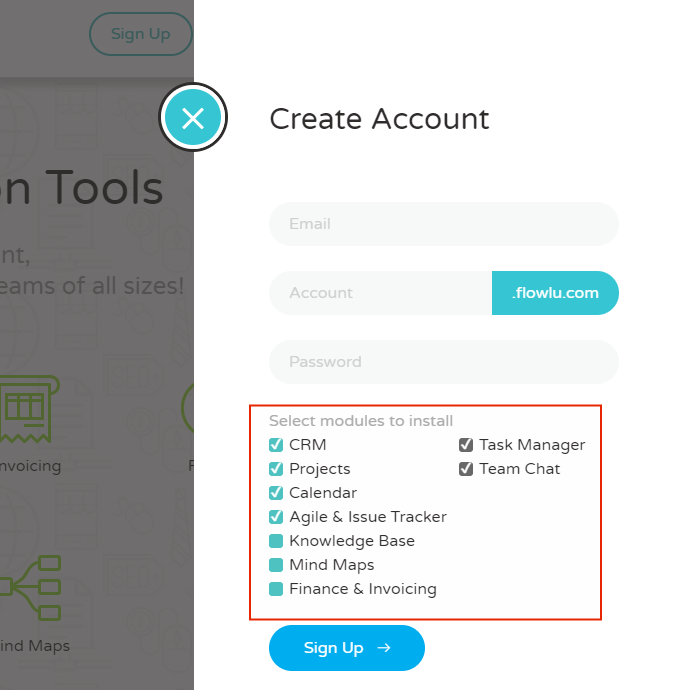 In the top panel, next to Flowlu logo “+” button is placed which allows you to create a task, an event, a project, opportunity, create new CRM organization or CRM contact and other (1). Next to it is the button which provides a global search of information by service (2). Here the name of the section where you are now is displayed (3). In top right corner buttons for quick access to notifications (1), chats messenger (2), personal notes (3), online support and last system update (4), personal profile and system settings (5) are located. 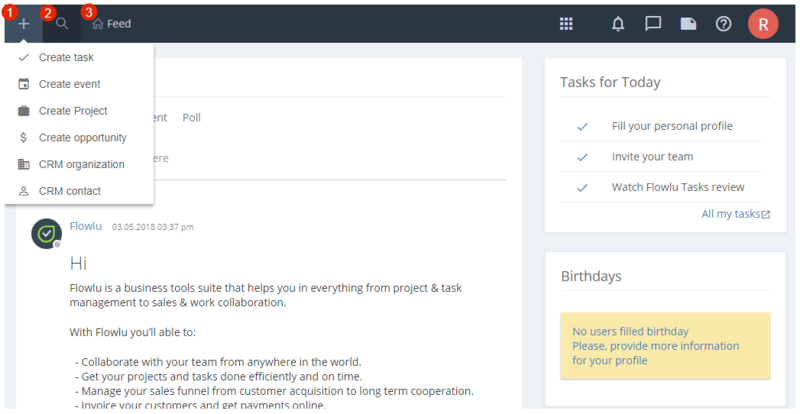 Below your tasks for today and nearest birthdays of your colleagues will be displayed.